Unlike linear mountain ranges that form along tectonic plate boundaries, the Adirondack mountains resemble a dome. They were formed by the recent uplift and exposure of previously deeply buried metamorphic and igneous rocks over a billion years old. The same rocks can be found in the Green Mountains in Vermont. They are bordered to the south by the Mohawk Valley, and to the west by the Tug Hill Plateau, separated by the Black River. 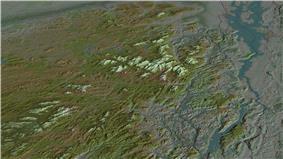 This region is south of the Saint Lawrence River. The Adirondack Mountains are contained within the 6.1 million acres (2.5×10^6 ha) of the Adirondack Park, which includes a constitutionally protected Forest Preserve of approximately 2,300,000 acres (930,000 ha). About 43% of the land is owned by the state, while 57% private inholdings, heavily regulated by the Adirondack Park Agency. The Adirondack Park contains thousands of streams, brooks and lakes, most famously Lake Placid, adjacent to the village of Lake Placid, two-time site of the Olympic Winter Games; the Saranac Lakes, favored by the sportsmen who made the Adirondacks famous; and Raquette Lake, site of many of the first Great Camps. The Adirondacks do not form a connected range such as the Rocky Mountains of the Western United States. They are instead an eroded dome consisting of many peaks, either isolated or in groups, often with little apparent order. There are over one hundred summits, ranging from under 1,200 feet (366 m) to over 5,000 feet (1,524 m) in elevation; the highest peak, Mount Marcy, at 5,344 feet (1,629 m), is near the eastern part of the group. Only two mountains, Mount Marcy and Algonquin, are over 5000 feet. The high peaks region, seen from a distance. Forty-six of the highest mountain peaks are considered "The 46" Blake Peak, Cliff Mountain, Nye Mountain, and Couchsachraga Peak) are in fact just under 4,000 ft (1,219 m). 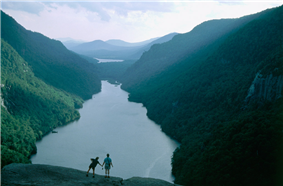 Some hikers who enjoy the Adirondack Mountains make an effort to climb all of the original 46 peaks, and there is a Forty Sixers club for those who have successfully reached each of these summits. Twenty of the 46 mountains remain trailless, so climbing them requires bushwhacking or following officially designated herdpaths to the top. Many of the Adirondack Mountains, such as Whiteface Mountain (Wilmington), Mt. Pisgah (Saranac Lake), and Mt. 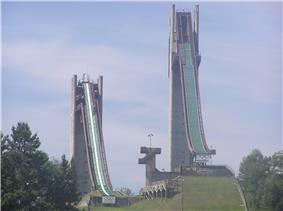 Morris (Tupper Lake) have been developed as ski areas. 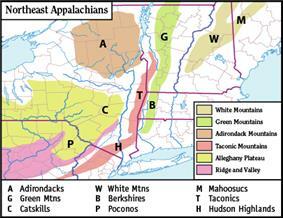 The Adirondack Mountains form the southernmost part of the Eastern forest-boreal transition ecoregion. They are heavily forested, and contain the southernmost distribution of the boreal forest, or taiga, in North America, with the exception of isolated mountains, such as Mount Greylock, located in the Northwest corner of Massachusetts. 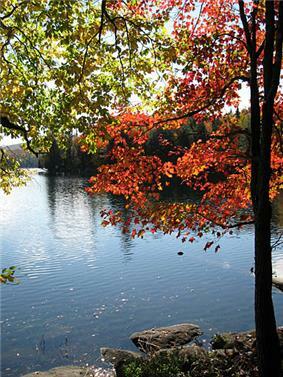 The forests of the Adirondacks include spruce, pine and broad-leafed trees. Lumbering, once an important industry, has been much restricted since the establishment of the State Park in 1892. The Adirondack area was made a park mainly because of the effect lumbering was having on the area and Hudson water supply. The mountains form the drainage divide between the Champlain, and on the west they flow directly into that stream or reach it through Lake Ontario. 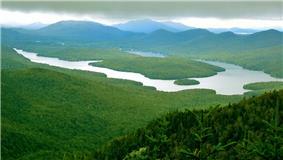 The source of the Hudson is near tiny Lake Tear-of-the-Clouds, nestled in the heart of the High Peaks area between Mt. Marcy and Mt. Skylight. The most important streams within the area are the Hudson, Black, Oswegatchie, Grasse, Raquette, Saranac, Schroon and Ausable rivers. The region was once covered by the The Fulton Chain, the Upper and Lower Saranac, Big and Little Tupper, Schroon, Placid, Long, Raquette and Blue Mountain. The region known as the Adirondack Wilderness, or the Great North Woods, embraces between 5000 and 6000 square miles (13,000 km² and 16,000 km²) of mountain, lake, plateau and forest. The mountains were given the name "Adirondacks" in 1838 by Ebenezer Emmons; the name is sometimes spelled "Adirondaks", without a "c". Some of the place names in the vicinity of Lake Placid have peculiar phonetic spellings attributed to Melvil Dewey, who was a principal influence in developing that town and the Lake Placid Club. The Adirondak Loj (pronounced "lodge"), a popular hostel and trailhead run by the Adirondack Mountain Club in the high peaks region, is one example. The word carries stress on the third syllable: . The mountainous peaks are usually rounded, though not the easiest to scale given the steep nature of the trails, humid climate in the summer, very cold and snowy in the winter, remoteness of many of the peaks, and round-trip trail lengths that often exceed 15 miles (24 km). There used to be many railroads in the region but most are no longer functioning. The surface of many of the lakes lies at an elevation above 1,500 ft (457 m); their shores are usually rocky and irregular, and the wild scenery within their vicinity has made them very attractive to tourists. Cabins, hunting lodges, villas and hotels are numerous. 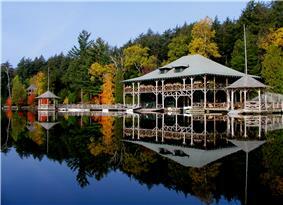 The resorts most frequented are in and around Schroon Lake and the St. Regis Lakes. Flatwater and whitewater Personal watercraft are a controversial subject in the Adirondack Park at this time. At the head of Lake Placid stands Whiteface Mountain, from whose summit one of the finest views of the Adirondacks can be obtained. 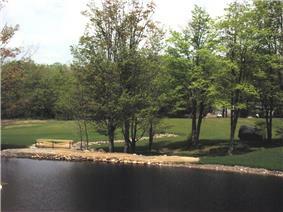 Two miles (3.2 km) southeast of this lake, at North Elba, is the old farm of the abolitionist John Brown, which contains his grave and is frequented by visitors. Lake Placid outflow is a major contributor to the Ausable River, which for a part of its course flows through a rocky chasm 100 to 175 ft (30 to 53 m) deep and rarely more than 30 ft (9.1 m) wide. At the head of the Ausable Chasm are the Rainbow Falls, where the stream makes a vertical drop of 70 ft (21.3 m). Another impressive feature of the Adirondacks is Indian Pass, a gorge between Algonquin and Wallface Mountains. The latter is a majestic cliff rising several hundred feet from the pass. Keene Valley, in the center of the High Peaks, is a notably picturesque region, presenting a pleasing combination of peaceful valley and rugged hills. The Algonquian and Mohawk nations used the Adirondacks for hunting and travel, but they had no settlements in the area. Samuel de Champlain sailed up the Saint Lawrence and Rivière des Iroquois near what would become Ticonderoga on Lake Champlain in 1609, and thus may have been the first European to encounter the Adirondacks. Jesuit missionaries and French trappers were among the first Europeans to visit the region, as early as 1642. 1876 map of the Adirondacks, showing many of the older, now obsolete names for many of the peaks, lakes and communities. Part of the Fort Ticonderoga after it was captured by the British. In 1757, French General Montcalm, captured Fort William Henry. 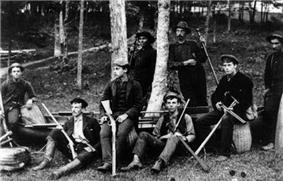 At the end of the 18th century rich loggers deeper into the wilderness. Millions of pine, spruce, and hemlock logs were cut and floated down the area's many rivers to mills built on the edges. Logging continued slowly but steadily into the interior of the mountains throughout the 19th century and farm communities developed in many of the river valleys. The area was not formally named the Adirondacks until 1837; an English map from 1761 labels it simply "Deer Hunting Country." 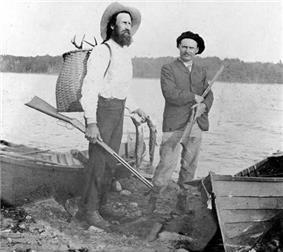 Serious exploration of the interior did not occur until after 1870; the headwaters of the Hudson River near Lake Tear of the Clouds on the slopes of Mount Marcy were not discovered until more than fifty years after the discovery of the headwaters of the Columbia River in the Canadian Rockies of British Columbia. ^ Van den Boagaert's 1634 glossary of Mohawk vocabulary, included in "Narratives of New Netherland", edited by J. Franklin Jameson, 1909 Chas. Scribner, New York, page 161. ^ A Guide to Rock Climbing and Bouldering in the Adirondack Park, New York. Adirondack Rock. Retrieved on 2013-07-12.